Karres and Brands, together with Döll architects have been awarded second prize for their plan "Life in the Stationsweg" by the City of Mönchengladbach. We designed a neighborhood where a combination of collectivity, freedom and a rural atmosphere are the main features, just like in a Kleingarten, an allotment. A green, environmentally friendly and safe environment for residents of all backgrounds and ages. 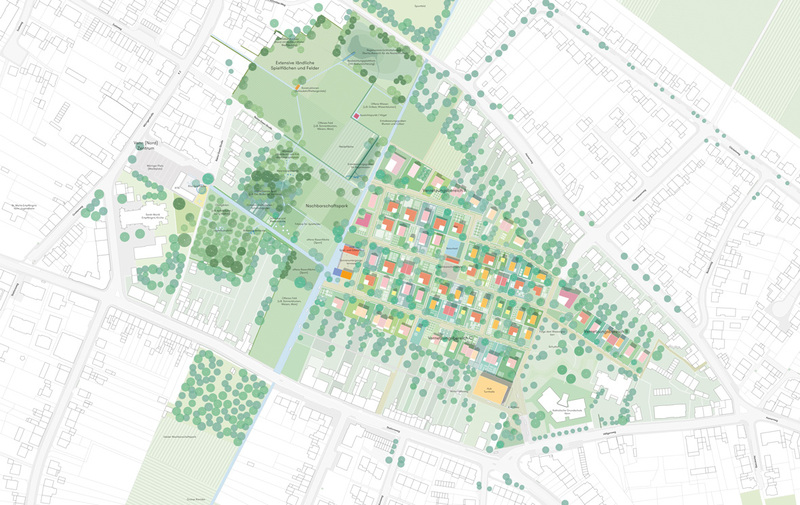 A neighborhood where residents themselves can build on their land within a flexible design framework, featuring a large park as “rural playground’’ in the middle. The unique location, on the outskirts of the city between the lively villages of Hamern and Venn, provided a good opportunity to develop a visionary proposal for a district where a rural, free lifestyle is accompanied by collectively shared facilities and social cohesion.